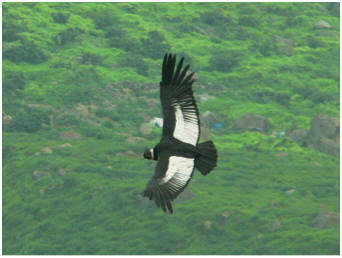 An Anden Condor soaring through the mountains. The male Andean Condor has a caruncle (flesh comb) on the top of this head. The Andean Condor (Vultur gryphus) is a species of South American bird in the New World vulture family Cathartidae and is the only member of the genus Vultur. Found in the Andes mountains and adjacent Pacific coasts of western South America, the Andean Condor has a wingspan of up to 11 ft. It is a large black vulture with a ruff of white feathers surrounding the base of the neck and, especially in the male, large white patches on the wings. Unlike most birds of prey, the male is larger than the female. The Andean Condor scavenges on carrion including llamas, alpacas, rheas, guanacos, and deer. Condors have large territories, and can travel more than 100 miles per day in search of food. Andean condors have been seen killing smaller animals such as rodents, birds and rabbits, which they usually kill with their beak. They locate the carrion either by spotting it or by following corvids or other vultures such as the Turkey Vulture, the Lesser Yellow-headed Vulture, and the Greater Yellow-headed Vulture to carcasses. 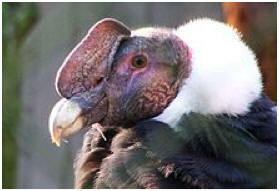 Andean Condors often go for days without eating, then gorge themselves sometimes to the point of being unable to fly. Condors provide an important service in the ecosystem by removing carrion which would otherwise spread disease. 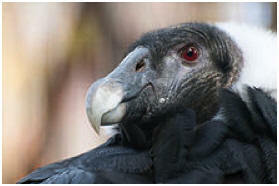 The condor is primarily a scavenger, feeding on carrion. It prefers large carcasses, such as those of deer or cattle. It reaches sexual maturity at five or six years of age and nests at elevations of up to 16,000 ft, generally on inaccessible rock ledges. A single egg is usually laid. It is one of the world’s longest-living birds, with a lifespan of up to 100 years old in captivity. The Andean Condor is a national symbol of Argentina, Bolivia, Chile, Colombia, Ecuador, and Peru and plays an important role in the folklore and mythology of the Andean regions. It is threatened by habitat loss and by secondary poisoning from carcasses killed by hunters. Andean Condors have wingspans which range from 9 to 11 feet and a weight of 24 to 33 lb for males and 18 to 24 lb for females. Overall length is around 4 feet. The Andean Condor lives in the South American Andes Mountains, including the Santa Marta Mountains. In the north, its range begins in Venezuela and Colombia, where it is now extremely rare, then continues south to the Tierra del Fuego. Its habitat is mainly composed of open grasslands and alpine areas up to 16,000 ft in elevation. It prefers relatively open, non-forested areas which allow it to spot carrion from the air. During certain sea lion and seal breeding seasons more Andean condors can be found along the beaches. The condor has huge wings and soars by flapping its wings on rising from the ground, but after attaining a moderate elevation it flaps its wings very rarely, relying on thermals and other forms of soaring to stay aloft. Andean Condors prefer to roost on high places from which they can take off without major wing-flapping effort. 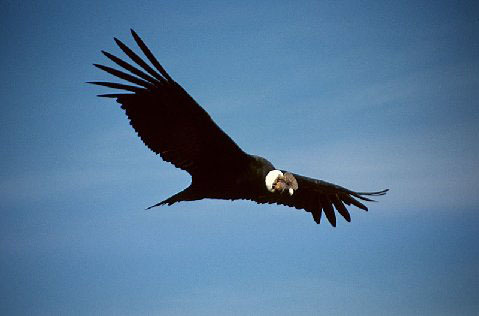 The Andean Condor was first placed on the United States Endangered Species list in 1970. Threats include loss of habitat, secondary poisoning, and direct poaching. Because it is adapted to very low mortality and has correspondingly low reproductive rates, it is extremely vulnerable to human persecution, most of which stems from the fact that it is perceived as a threat by farmers due to alleged attacks on livestock. Reintroduction programs using captive-bred Andean Condors, which release captive-bred birds are underway in Argentina, Venezuela, and Colombia. When raising condors for release, human contact is kept at a minimum. The chicks not left with parents are sometimes fed with condor puppets to prevent the chicks from imprinting on humans. Released condors are sometimes tracked by GPS satellite in order to observe their movements and to monitor how they are doing in the wild. The USFWS first used Andean Condors to develop the captive breeding and rearing procedures for the CA Condor Recovery program. Later, between 1987 and 1992, female Andean Condors were released in Southern California to test the release stages of the program. 13 birds were released and then recaptured and re-released in South America. The Andean Condor is a national symbol of Argentina, Bolivia, Chile, Colombia, Ecuador and Peru. It is the national bird of Bolivia, Chile, Colombia, and Ecuador. The Andean Condor is considered a symbol of power and health by many Andean cultures, and it was believed that the bones and organs of the Andean Condor possessed medicinal powers, sometimes leading to the hunting and killing of condors to obtain its bones and organs. In some versions of Peruvian Condor Festivals, a condor is captured and then tied to the back of a bull, where it pecks at the animal as bullfighters fight it. The condor is often injured or killed by the bull hitting the walls or rolling over.. There is also a horrific ceremony known as the arranque del condor in which a live Andean Condor is suspended from a frame and is punched to death by horsemen as they ride by. Public outcry is helping to slow or even end these barbaric events.